well, due to lack of time it seems like the initially monthly newsletter is turning into a quarterly one. 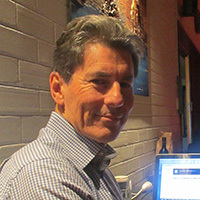 However, this is Bernhard from TANGO-DJ.AT, Association for the preservation and provision of Argentine tango with my newsletter about international tango events, DJ-ing, special tango CDs and much more. Please note that videos, sound samples and special characters might not display correctly in the e-mail. Please visit the online version instead. Enjoy! The first edition was a huge success and we are looking forward to welcoming many dancers again for the upcoming events! 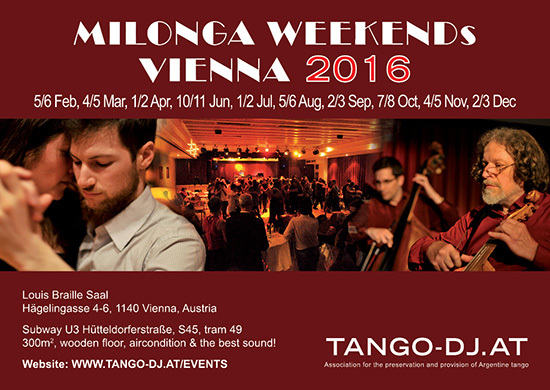 If you are interested in visiting our International Milonga Weekend as dancer or DJ please find all dates and DJs (as fixed so far) for 2016 on our website. Bandolera shoes will be presented by Zsoka Sallai on Saturday. Please find details and updates on the VCTM-website! If you have any questions please do not hesitate to get in touch with us! Some of you might wonder when the next CTA release will become available. Short answer: We don't know. Long one: It has been reported to us that Mr. Akihito Baba experienced some health issues in the end of 2015 and beginning of 2016. At this moment it is uncertain if there are going to be any new CTA releases. We consider this being a big hit for the distribution of new tango music as most of the new transfers being produced nowadays were based on the the collection and work of Mr. Akihito Baba. We wish Mr. Akihito Baba all the best in recovering as soon as possible and we do hope that he will also be able to publish some more releases. There are only a few pieces left of his last release from September 2015 in case you did not get yours already. 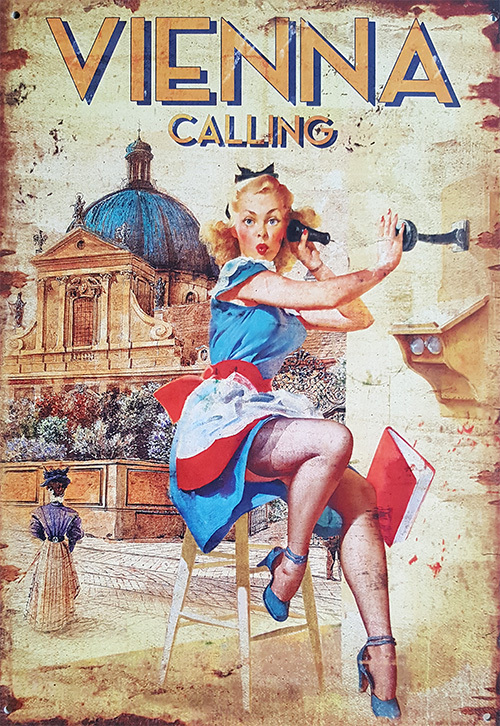 Some more are offered in our CTA shop. More and more contemporary tango orchestras start to play tango music for dancers. I personally think it is a very good developement and will help organizers and musicians to bring more live music into the Milongas as dancers become used to the fact that you can also dance to live music just fine. 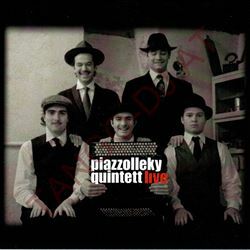 Other than the name would imply Quintett Piazzolleky also joined the orchestras for dancers recently. 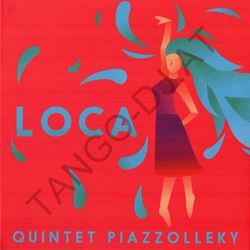 When their first CD "Piazzolleky Quintett Live" featured works of Piazzolla and therefore will turn out to be difficult to dance, their latest CD "Loca" was produced with the aim to make people dance. And it worked out well. The recordings are even arranged in a Milonga useable TVTM tanda structure! "Project Tahiti" has started! 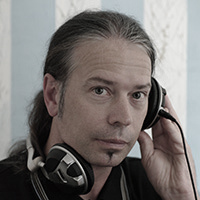 I am very excited as our small, international group of developers and supporters finally has started to develop v3 of the TANGO-DJ.AT database. Besides of a complete new backend for exporting the necessary data, a complete new frontend and database presentation is going to be developed. As most exciting new features the TANGO-DJ.AT database v3 will be able to show cover art scans and prelistening possibility! Those additional new functions will be made available to all of our members free of charge! 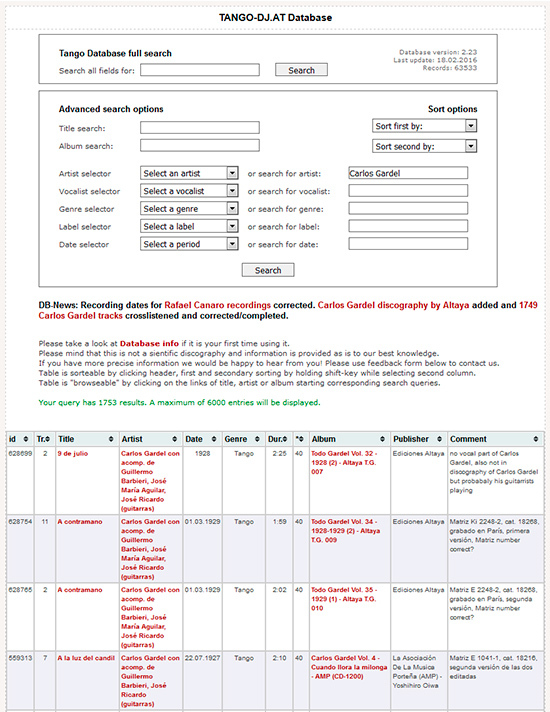 If you want to support our work with this database please get in touch with us!